I am a real big fan of Perfect Dark. But everyone likes the N64 version. I think they are forgetting that there is a GBC version of Perfect Dark, also. I may be the only person in America to say this, but I like the GBC Version better. It's my favorite Game for the Game Boy Color. I have the N64 version but it's the same thing as GoldenEye 007. I like Resident Evil, and Perfect Dark GBC shows that it can be like Resident Evil pocket sized! The voices are very good. The action is awesome, and the game is realistic unlike most other Game Boy Color games. Here is a site devoted to the GBC Version of the game. 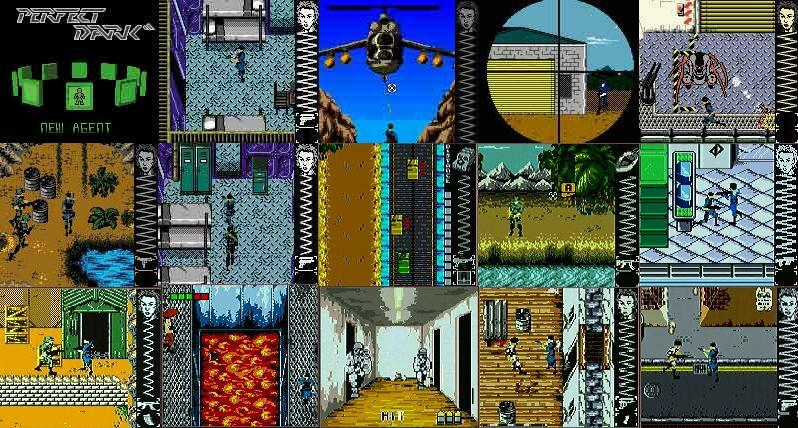 Right now I just have screenshots of the game showing you how great it is. Soon I may have maps to the Game. Because this game is very difficult to complete. It has been almost two years that I have owned this game. I wanted this game so badly I sold a Super NES just to get it. 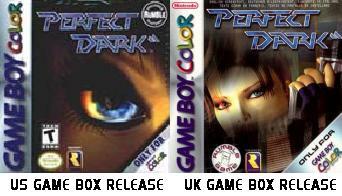 By the way...I was at the Oskaloosa, Iowa Wal-Mart on June 30, 2008 and an unexpected surprise...I was looking in the video game cases and carried not only one but SEVERAL copies of Perfect Dark for the Game Boy Color! This game has been out for what...eight years? This is as interesting as the Wal-Mart I work at selling issues of Nintendo Power magazine that are five years old and the Nintendo Power Game Boy Camera guide that was released in 1998! Yes we still sell them, amazingly (brought them from the old store to the new store even!) Just thought I'd comment on that. This is the box art for the game. I like the UK box release best. I don't understand why they couldn't release that box in the US! Here are some screenshots of the GB Version of PD. To me, I think the game looks very impressive, don't you think? Need the GBC Rom because you cannot find the game in stores? Click The Link To Download it: PERFECT DARK! After you kill an enemy, walk over him and press Select to see if you can steal any weapons from them. Note 1: With this code, you must turn the switch off while first starting the game, and it has to be off when starting and ending levels. Otherwise the game will freeze. Note 2: With this code, you can only use it if you continue a saved game with a shotgun!